Established 15 years ago, LINK is today a major Brazilian wood exporter. 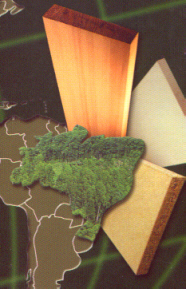 Working throughout Brazil, we are able to offer our clients the widest possible range of species and products. Our tropical lumber division operates in the major Amazon forrest regions, engulfing the Brazilian states of Mato Grosso, Rondônia and Pará. In these areas, mills saw rough sawn boards for our consumption under the watchful eyes of our quality control supervisors. The lumber is then transported to our facilities where the lumber can then be Kiln Dried, in computerized Kilns with specific and tested Kiln Drying programs for each specie. The lumber can then be machined into surfaced lumber, deckings, floorings or industrial parquet, using percise machinery with qualified technical operatives. Our wood products pass through several quality checks : at the saw mills, entering and exiting the Kilns, after surfacing and finally when being bundled. We thus guarantee finished products with a very high quality. It is with the quality and competitivness of our wood products that we seek to maintain our clients satisfied, seeking always to improve our service. We would very much to include you within our list of clients, and to be able to supply with the best of wood products which Brazil has to offer. We look forward to hear from you soon.